Th-INK-ing of You: Happy Birthday between friends! Hello my friends! Today I have something that I made purely for fun. The challenge over at Cheery Lynn Challenge Blog is Birthdays! I have had some Lili of the Valley stamps ( this one is called coffee break) that I ordered some time ago now, and have not had time to play with yet... today was the day. I used the sketch from Card Positioning Systems 261, and my papers are a yellow base by Martha Stewart, and dp by MME, Miss Caroline Howdy Doody. LOVE this new paper!!! I used the Cheery Lynn Polynesian Sails die to frame my image, and stamped the Happy Birthday sentiment from Hero Arts and cut with a Spellbinders Tags 5 die. The image is colored with Copics and some simple bakers twine finished it off..... nice and simple, but I had so much fun coloring this. It's a change for me. I hope you enjoyed it. Thanks so much for stopping by, and your comments give me such joy! This is adorable, Grace! I love these papers, too, and the image is just so precious! Fantastic coloring! Hi, I really, really like this card..thanks for posting. But I would like to know a little bit more about the stamp..where did you get it? What is the name? I have searched and cannot find. I have edited the post with a link to lili of the valley stamps, and the stamp is called coffee break. The link I posted takes you to the page that Coffee Break is on... well down the page. Hope that helps! Grace, this is a real beauty....love that image!!! Very pretty!! Love the colors and image. Good luck and thank you for joining us at Cheery Lynn Designs. Grace, this is so sweet! The stamp looks awesomes framed with the Poylynesian Sails doily. 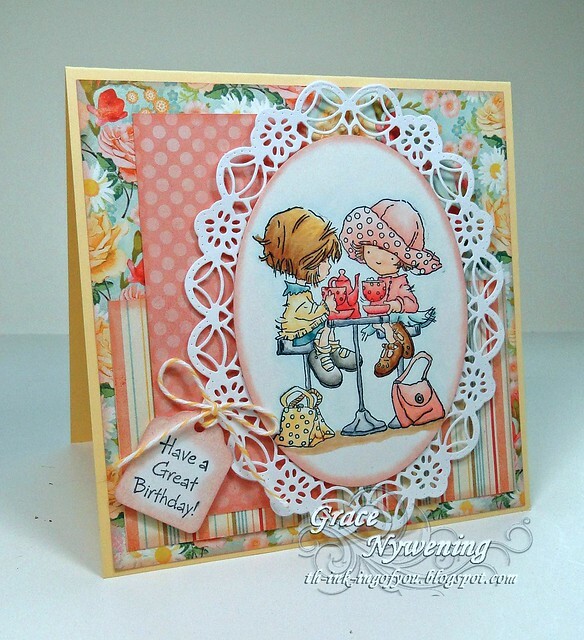 Thanks for joining us at Cheery Lynn Designs challenge and good luck! Your card is so lovely! I have to share that the song "Blessings" by Laura Story holds such a special place in my heart. I lost my husband to brain cancer 2 months ago and Laura's husband also has brain cancer and the story behind this song is shared on a video on you tube. Each time I hear it I think of my husband and it comforts me. Today, as I was missing him I happened to click on your card from the Cheery Lynn site and what should start playing but "Blessings".....it was like a little hello from my sweet Stuart. Your blog has touched my life today and I just wanted you to know....blessings to you! How sweet, Grace! They are so cute, and I love having tea with a friend. Beautiful job, and gorgeous colors! Grace this is adorable - isn't it great when we can make a card just for fun!! Grace, this may not have your usual flowers and layers, but it is not simple. I have this LOV stamp and just love it. You have colored it magnificently and those papers and just gorgeous. Blessings for a great week. Oh, my word! Grace, this is absolutely precious and so beautifully colored! Lovely card! Must check out that oval die cut, too! Beautiful! cute, cute and absolutely adorable!